Well it’s on cold days like these that we all need something warm for the soul and easy to prepare in the kitchen. Today I am going to make my creamy chicken pot pie for all of you. This chicken pot pie is simple to put together and really good for using up those scraps of chicken or endless chicken drumsticks that seem to linger at the bottom of the freezer. That’s what I am using today the drumsticks that managed to sneak past me and make their way to the bottom of the freezer. With any homemade pot pie you can use whatever protein you like as you don’t need to use just chicken. The drumsticks weren’t completely defrosted but enough to be put into the oven to cook off until browned through. I will also keep the bones and skin and make some chicken stock from them so I always have it on hand. Having chicken stock on hand is always something hand for every pantry. Besides, chicken stock is so easy to make. Left over chicken bones and skin, some juices out of the bottom of the pan and veggies that’s just about on the way out. Today for my chicken pot pie I’ll be using spring onion tops that I keep in the freezer, onion halved with the skin on, a carrot, celery, some herbs, salt and pepper. Just add enough water to cover the bones. I usually simmer the stock for a good 3-4 hours on low or overnight. Once I let the chicken stock cool I drain the liquid and discard everything else. I put the homemade chicken stock into containers then into the freezer they go. Now when you want to make soup you have an extremely flavourful chicken stock to use as your base. 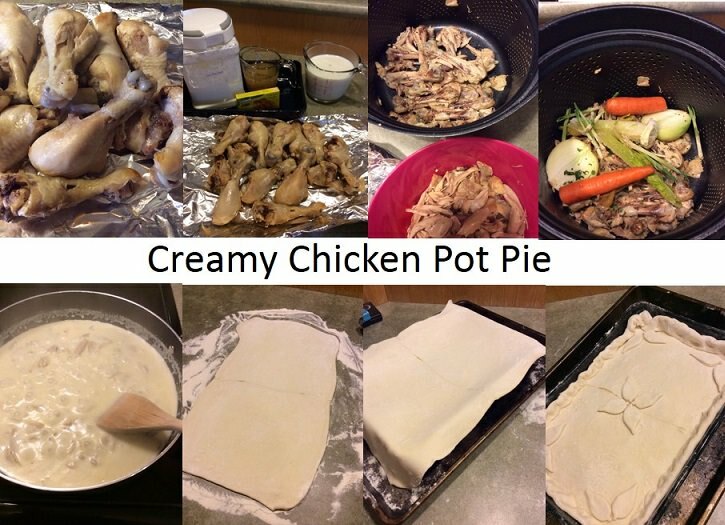 I have used this chicken pot pie recipe for many things from filling voluvaunts or by adding ham to make a bigger meat dish to thinning it down adding more vegetable and calling it soup. The list goes on and on so just use your imagination and get creative. 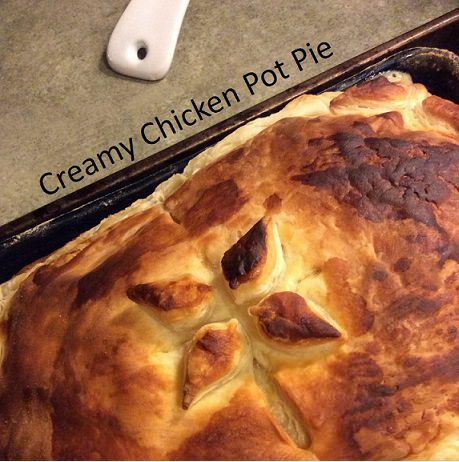 I made this chicken pot pie using puff pastry for this recipe but if you have time and want to make an easy chicken pot pie pastry you can easily use the pastry recipe from my mincemeat pie pastry recipe. This homemade chicken pot pie recipe is just another basic recipe that can be turned around at the last- minute to make a great meal for any occasion. A hot chicken pot pie is simple to make and uses up all of the leftover vegetables in your refrigerator to eliminate any food waste. Cook drumsticks in the oven for 45 minutes or until fully cooked. Chop up vegetables if you are adding any. Mix milk, stock cube and cornstarch together and add to the chicken. Bring to the boil and stir until thickened. Note: If you find sauce to runny just add a bit more cornstarch. Vice-versa if it's too thick add more milk. Carefully place the pastry over your dish and cut any excess away from the side. Any spare bits of pastry can be used to decorate pie. Glaze your pie with some milk and place in the oven for 30 minutes or until the pastry has puffed and turned golden brown. 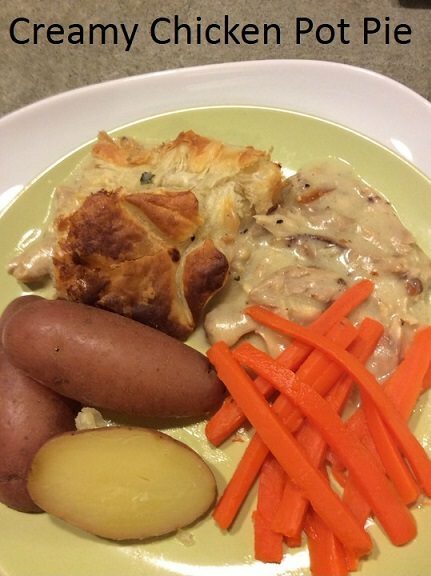 There you have it, a wonderful chicken pot pie that can be simple but elegant for any lunch or dinner. 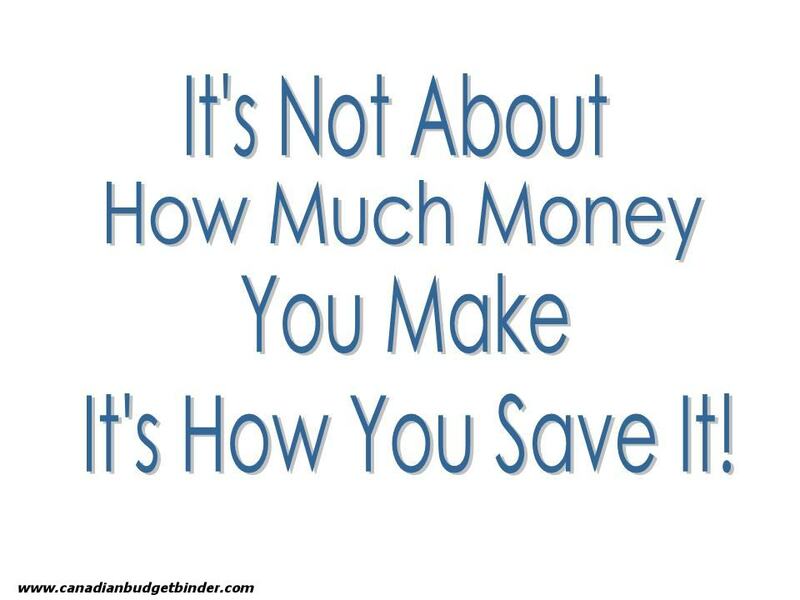 make it even richer for those of us who don’t care about the calories. Yum!!!!!!! I will be adding the veggies to this as hubby and the boys have been known to skip the veggies if given the choice, especially hubby. So I remove the choice and add lots of veg!!!! I know …I’m sneaky!!lol! I have both chicken and turkey stock in the freezer I have made just waiting to be used in something good. I add a step making the stock, I park it in the fridge overnight to let the fat rise up so I can skim it off to make fat reduced stock. Then it goes into the freezer. This looks like a tasty meal I can whip up quickly and easily. Looks good enough for a company dinner too!!!!! Thanks Nicola!!! Now off to run off that fat squirrel at the bird feeder…….know any good recipes for squirrel????? Haha I have never used squirrell before there’s always a first time lol it’s protein isn’t it!. Yeah I am sneaky with the veg to sometimes.